In 1953, in Jonesboro, Arkansas, a baby boy was born--dead. The attending physician set his little body aside and tended to his mother for eighteen minutes. Now, more than sixty years later, that boy leads an internationally known ministry that encourages hundreds of thousands every year. 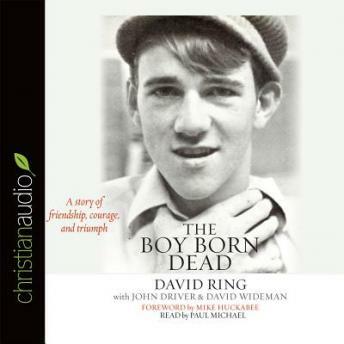 The Boy Born Dead tells his incredible story from the perspective of his best friend, David Wideman.As a teenager in the small town of Liberty, Missouri, in the late 1960s, David Ring grew up with the challenges that come with cerebral palsy, a result of his eighteen minutes of newborn silence. Along with his physical limitations, Ring was orphaned and shuffled from home to home, finally landing in an abusive situation that made him feel unworthy of love and, eventually, unworthy of life. But God had a purpose for Ring's life, and sent an agent to help him achieve it. Through the friendship of David Wideman, a boy he met in the halls of Liberty High School, Ring found strength he didn't know he had and went on to face his demons, marry the love of his life, and start an international speaking ministry.Full of hope, this moving story illustrates how friendship and love triumph over adversity. Anyone who faces tough times will treasure this story of hope and courage.